has retractable arm and claw! 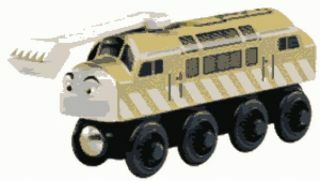 Diesel 10 is a renegade diesel engine on the Island of Sodor and is 10 out of 10 for brutal strength and devious deeds. He is out to destroy the harmony of Sir Topham Hatt's Railway.